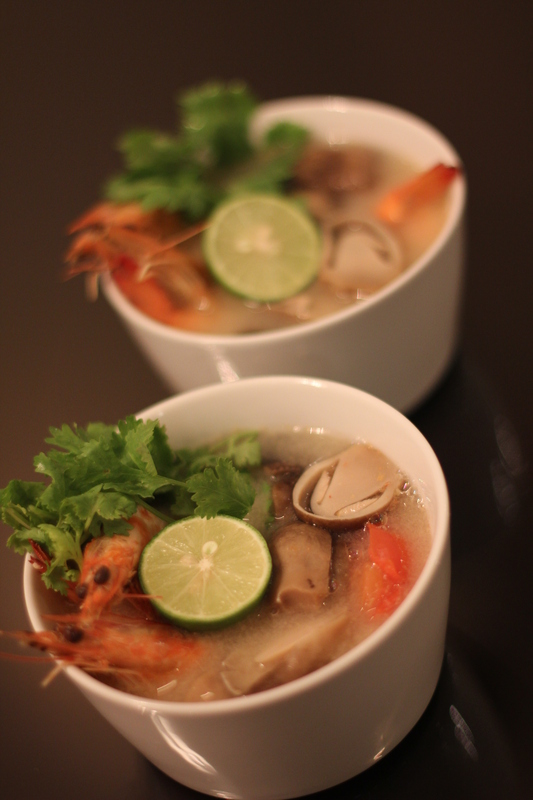 So I’ve always loved tom yum goong, but never tried making it myself. 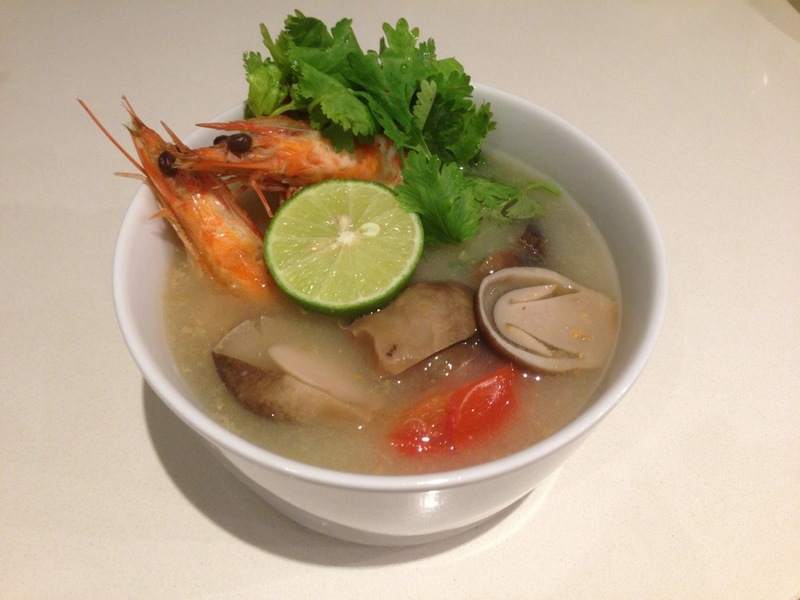 So when I saw a tom yum recipe on the high heel gourmet’s blog (http://highheelgourmet.com/2013/04/25/tom-yum-goong/) , I was really motivated to make it myself! 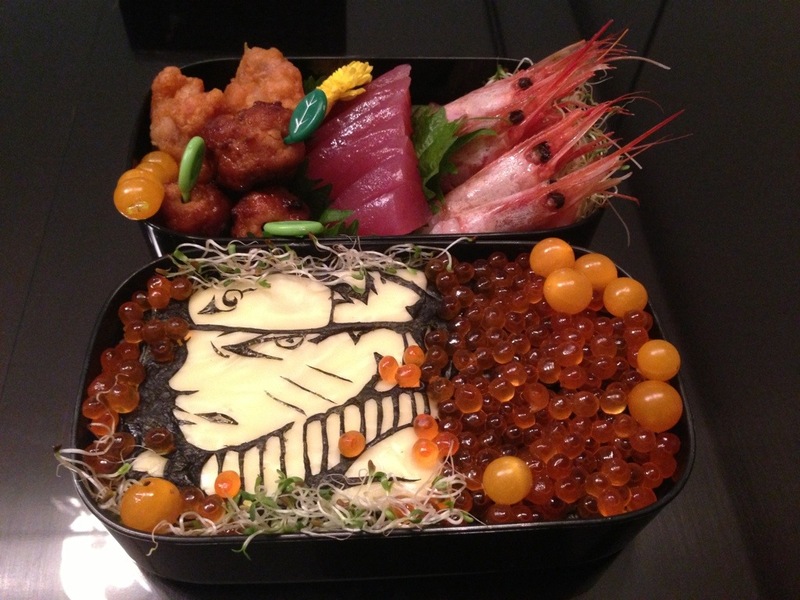 Hers looks delicious and authentic. 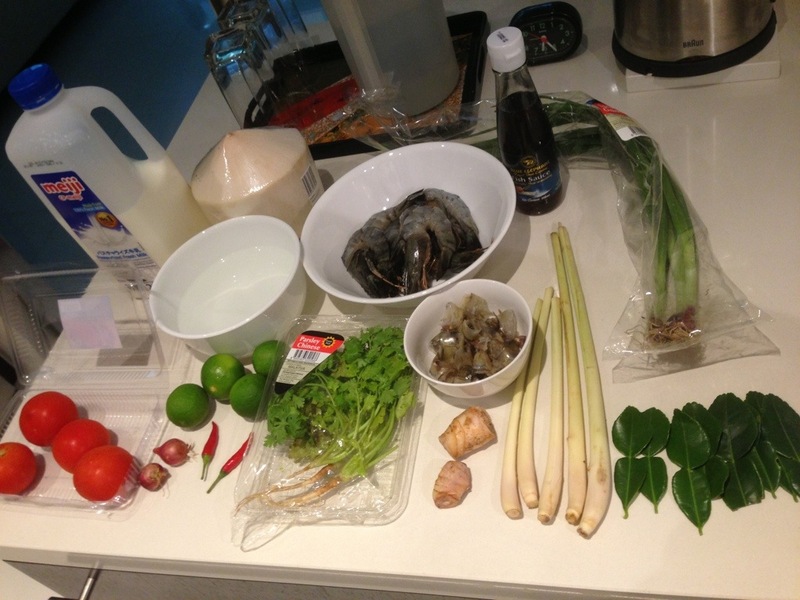 1) For big prawns like the ones I’m using here, peel them, leaving the heads intact. De-vein the prawns and keep all the shells. 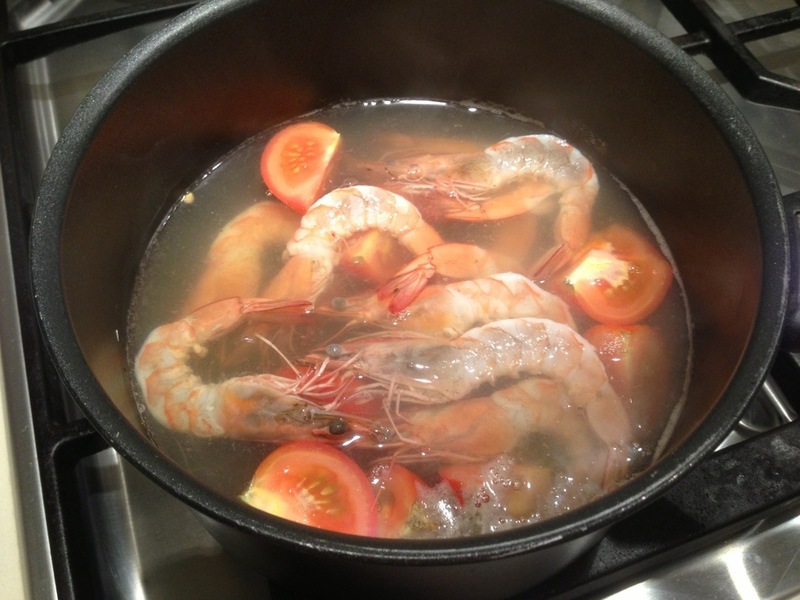 If you are using shrimp (smaller-sized prawns), pull the heads off alongside the shells and save them, also then deveining them. Set them aside. 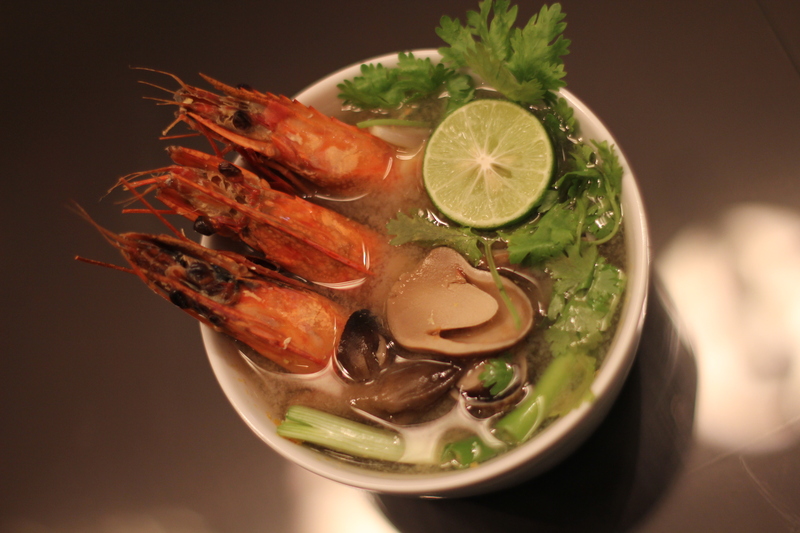 2) Boil the 6 cups of liquid before adding the shrimp/prawn shells and shallots, and over the course of cooking, add water or stock as needed. 3) Meanwhile, boil another pot of water. 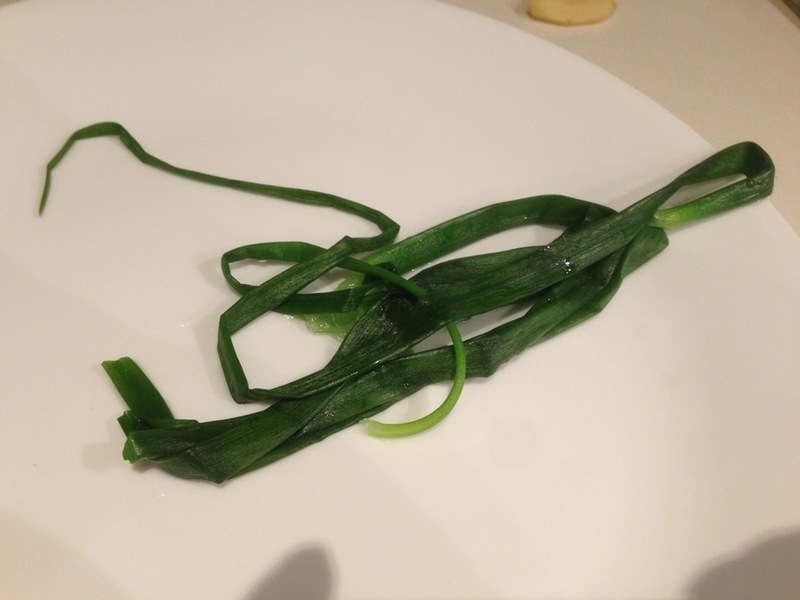 This is where you’ll blanch your spring onion leaves so that it becomes malleable and you will be able to tie the bouquet garni with it. 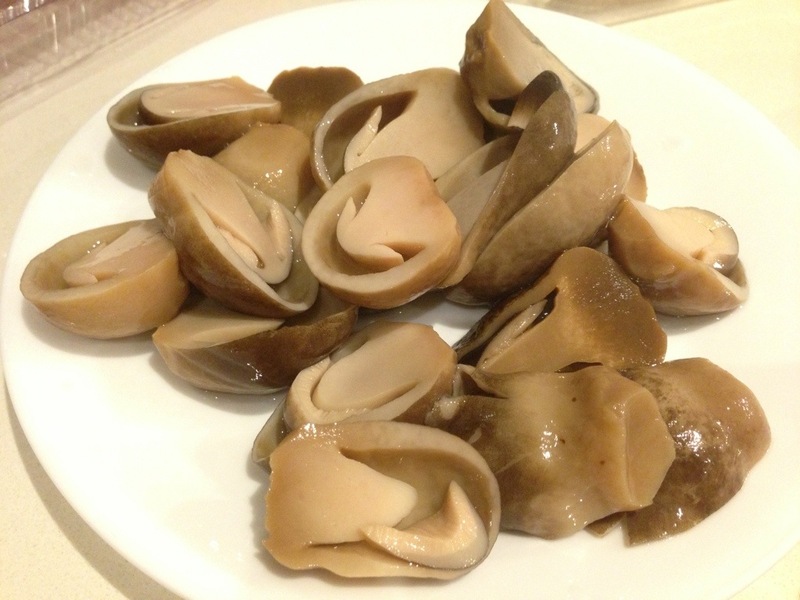 Blanch until soft then remove immediately. 4. 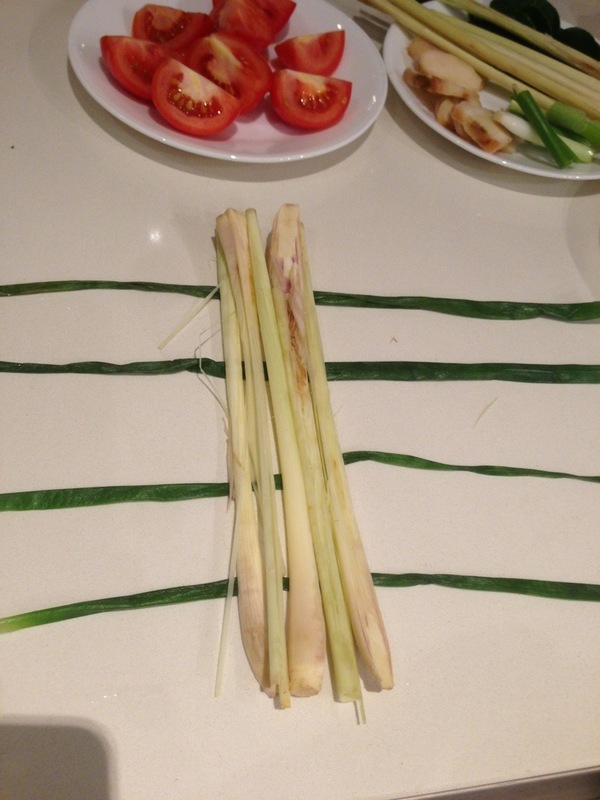 Crush the lemongrass along the stalks and slice them lengthwise. 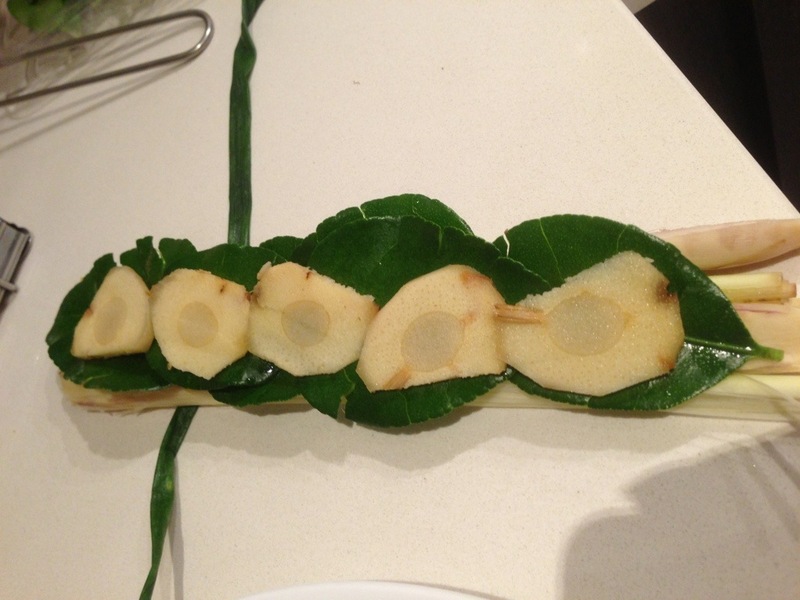 Peel the galangal and slice it thinly. 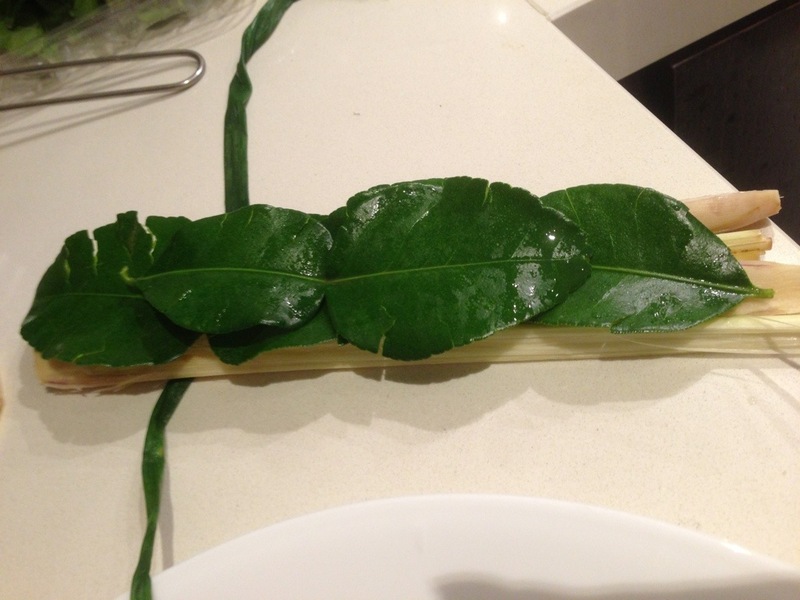 Tear the kaffir lime leaves towards the main stem, leaving the stem intact to keep them attached. 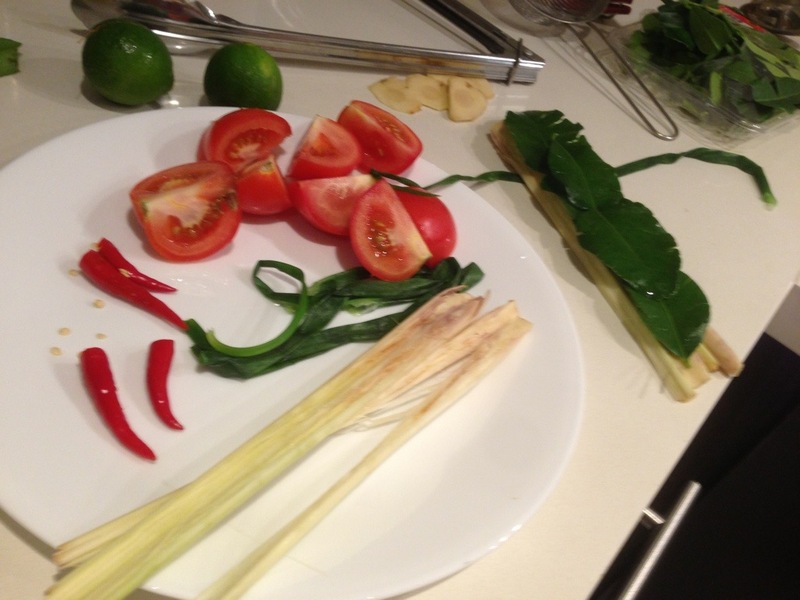 Lay the blanched spring onions as below and place half the lemongrass on top, followed by kaffir leaves, galangal, more kaffir leaves and the rest of the lemongrass. Tie all of them into a bouquet garni so it doesn’t float all over in your soup. 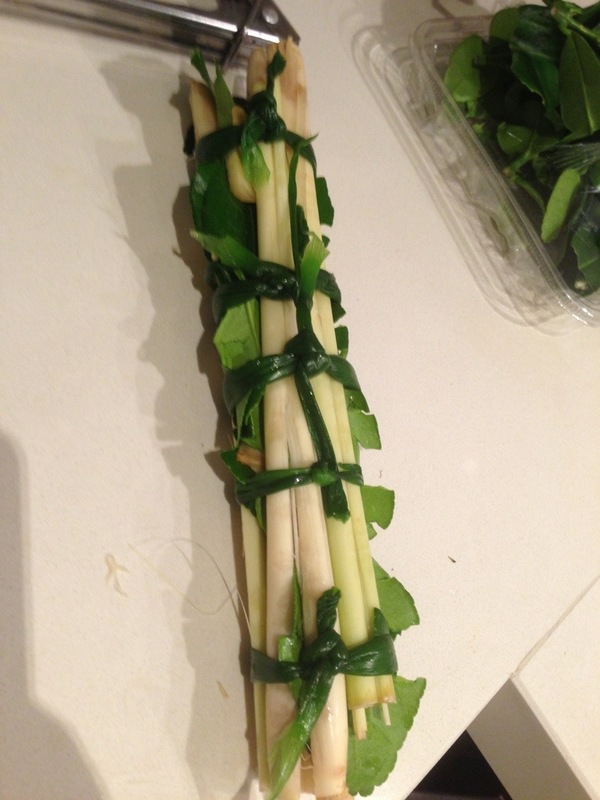 When you’re done, cut the bundle down the middle (please make sure that both sides are equally secured by the spring onions) so it fits into your pot. 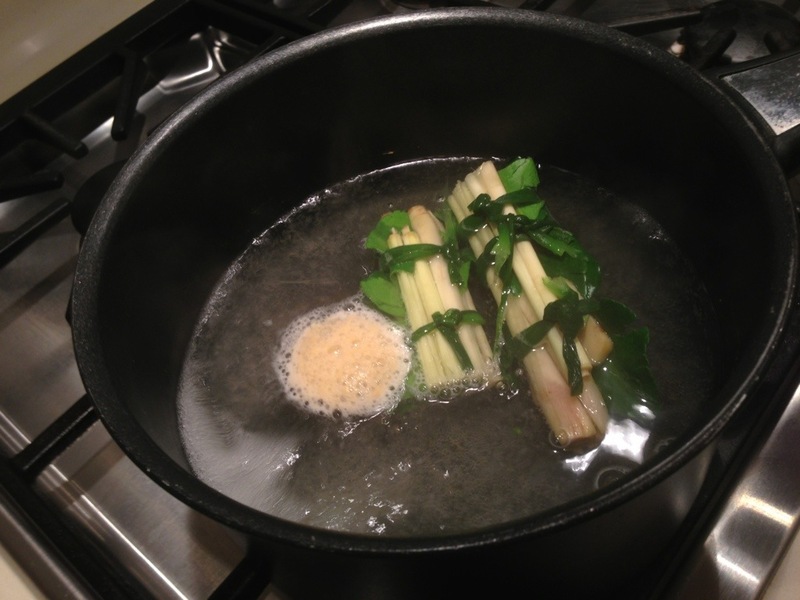 5) Place the bouquet garni into the pot and bring to a boil again, then lower the heat and let it simmer for another 10 minutes. 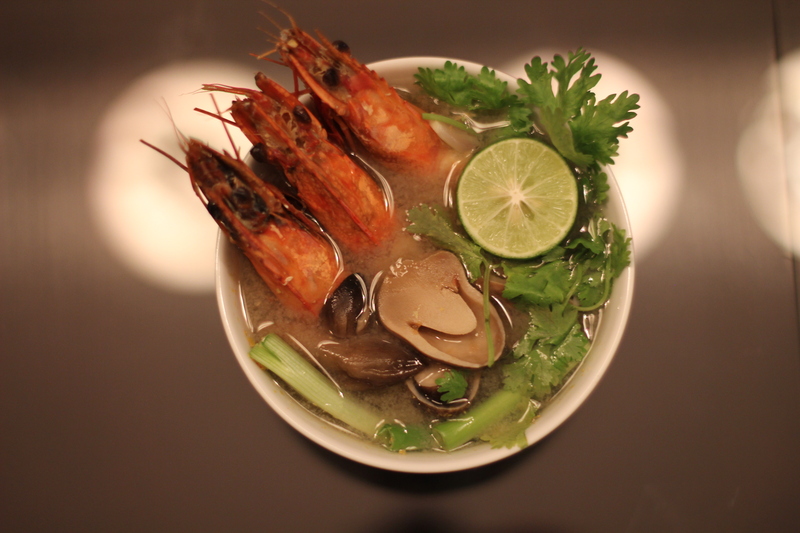 5) Season the soup. 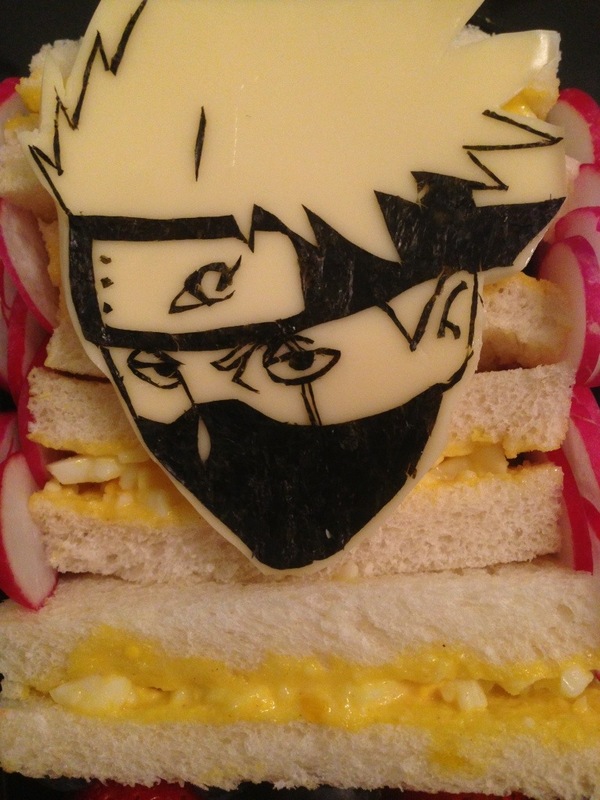 The high heel gourmet (a.k.a. 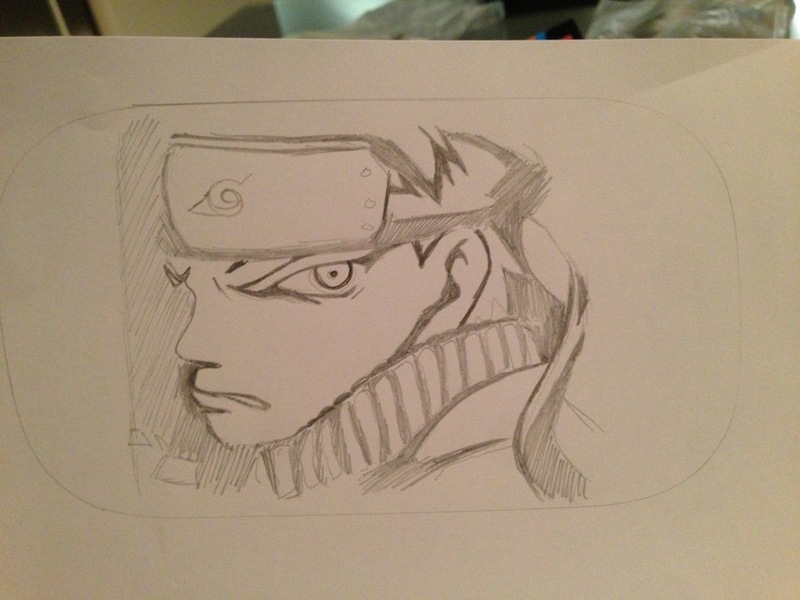 Miranti) says that first we must get the salty aspect right. 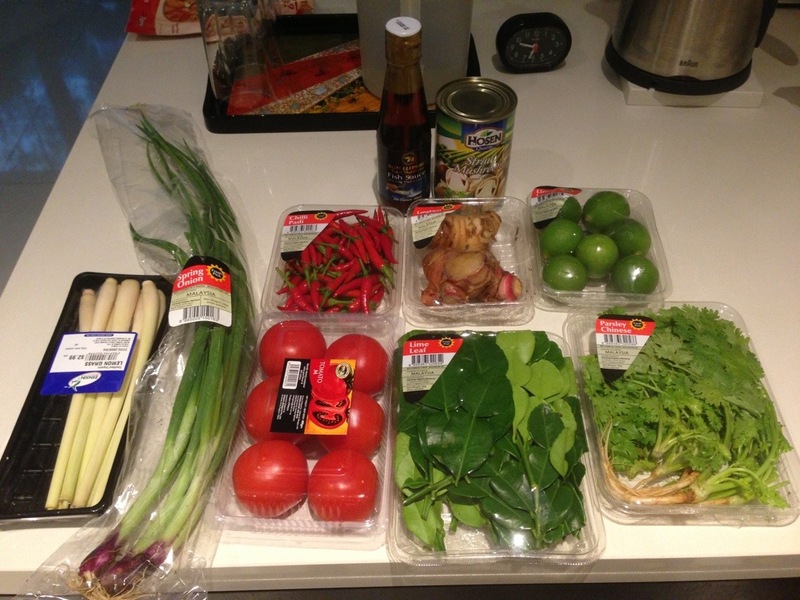 First, add the fish sauce, followed by some salt. When you’re happy with the saltiness, drop the rock sugar into the pot (Always handy to have some crushed ones ready at hand, its easier to apportion and cook). The rock sugar is meant to offset the bitter taste of the herbs. Then you taste the soup again to ascertain if more salt is needed. 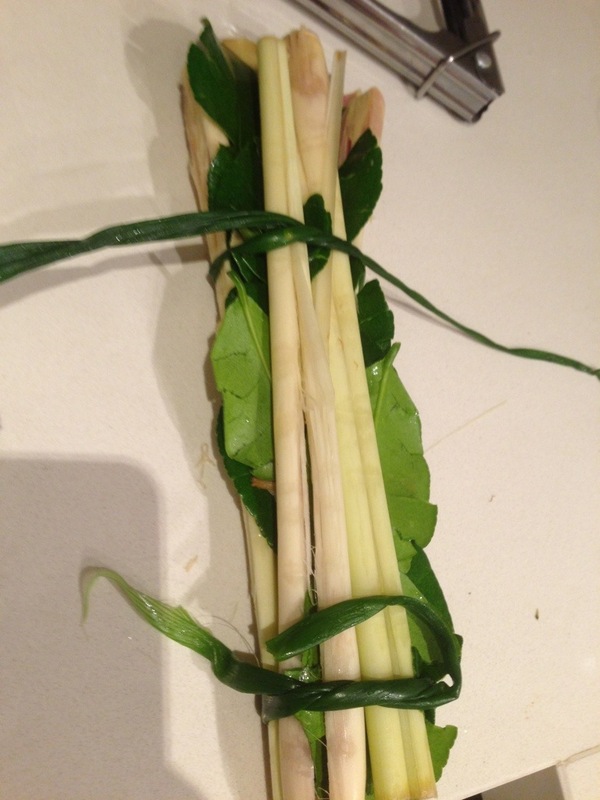 6) Take out the shrimp shells and leave the bouquet garni. 7) Increase the heat to high again. 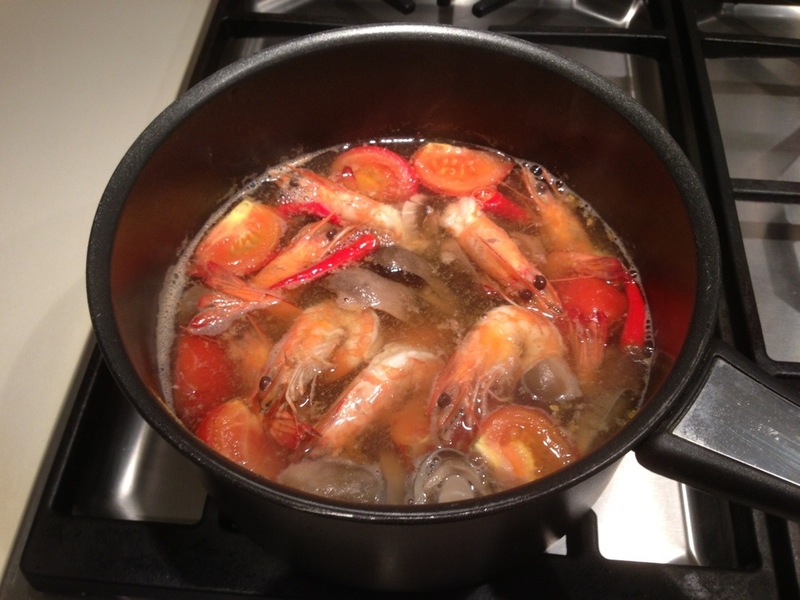 Add the mushrooms, tomatoes, young coconut flesh if you have it, and the prawns/shrimp. 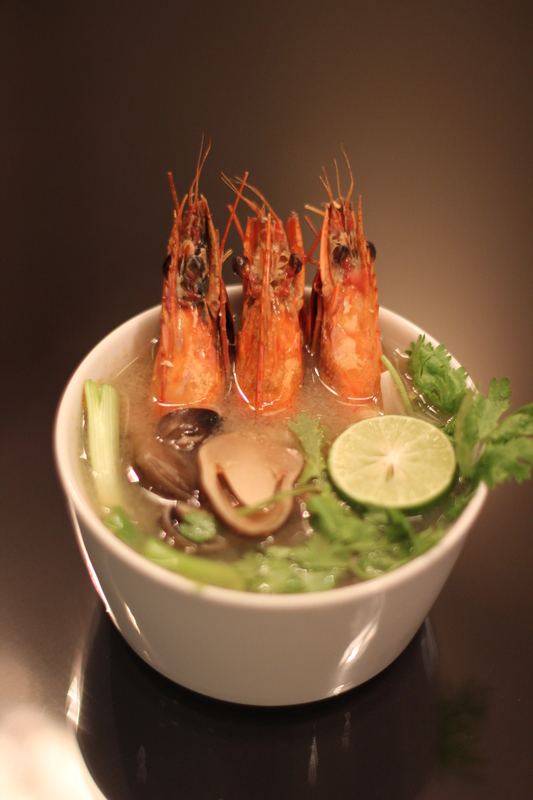 If you want your Tom Yum to be quite hot and spicy, you can add chilies right now, but if you want it somewhat spicy but not over the top, you add them later once its done boiling. 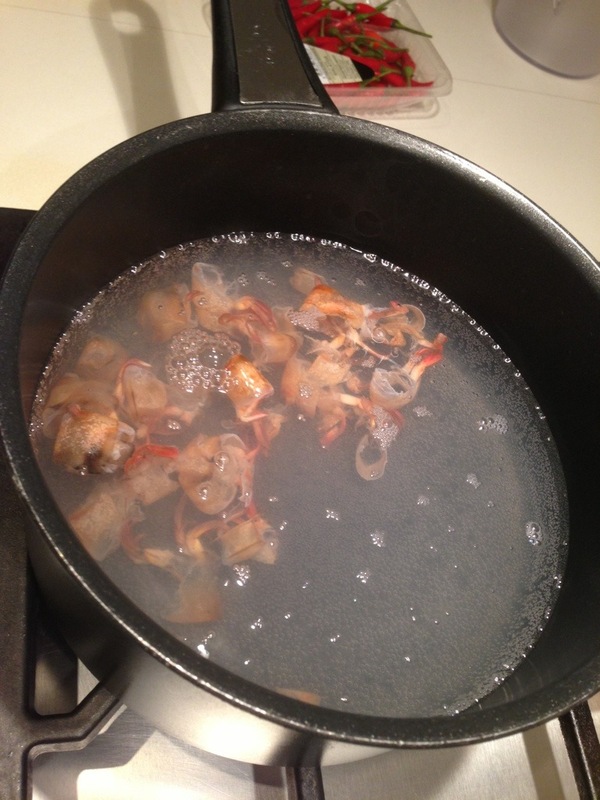 8) Let it come back to a boil, then turn off the heat right away. 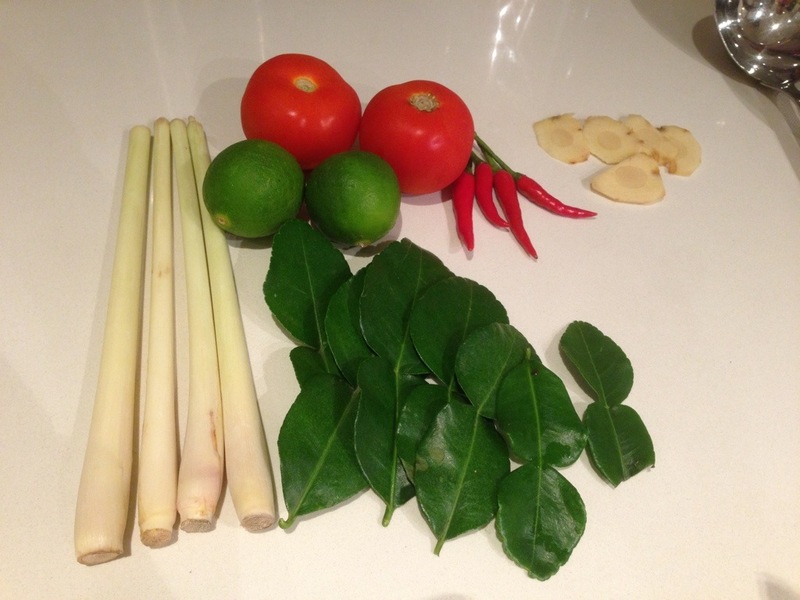 At this stage you can add the Nam Phrik Pao, crushed chilies, lime juice, and milk if you like. 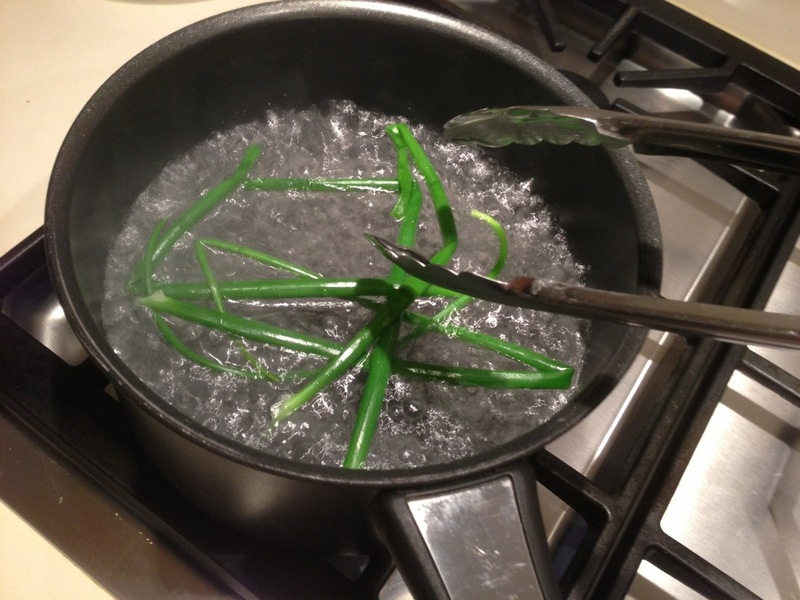 9) Garnish with green onion, a slice of lime and cilantro. 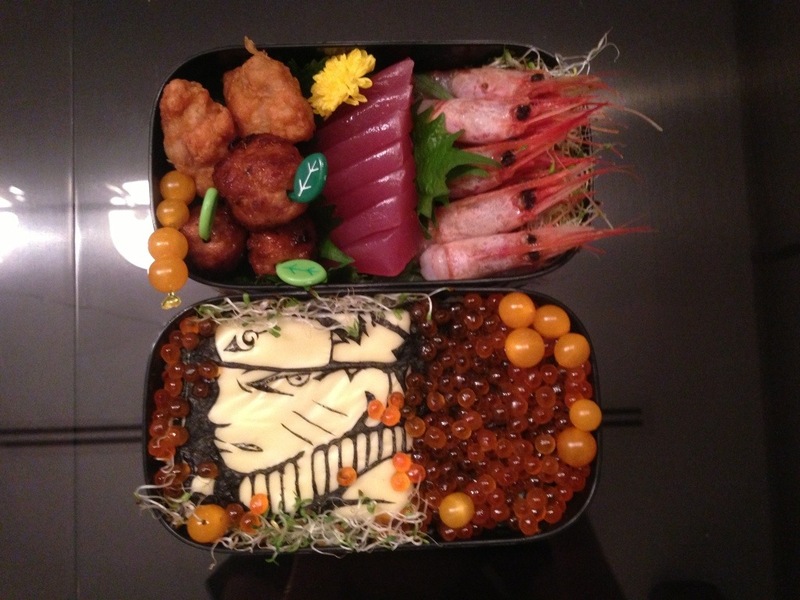 It was yummy and really simple to make! 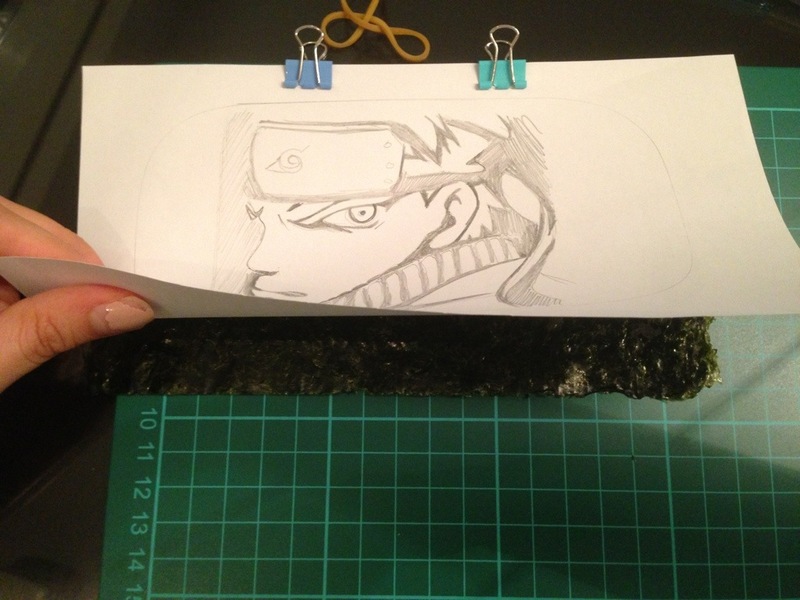 Next, place the sketch over the seaweed on the cutting board, and clip paper and seaweed securely onto the board. Start cutting the white bits. 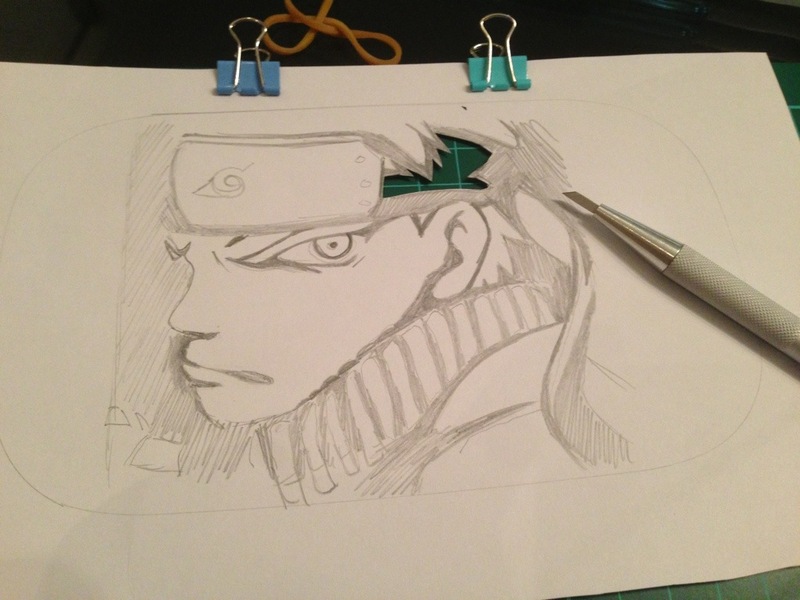 That is the cutter I used. 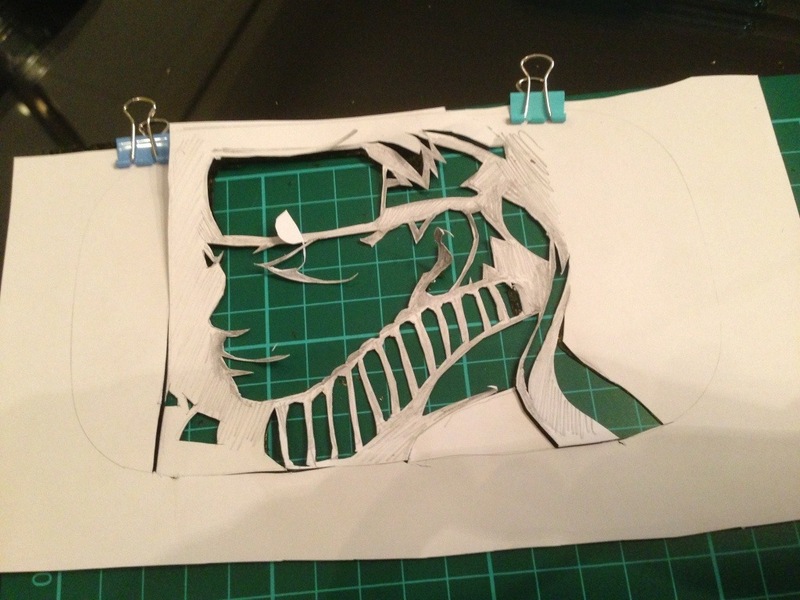 I initially used a ceramic cutter but this is way easier. 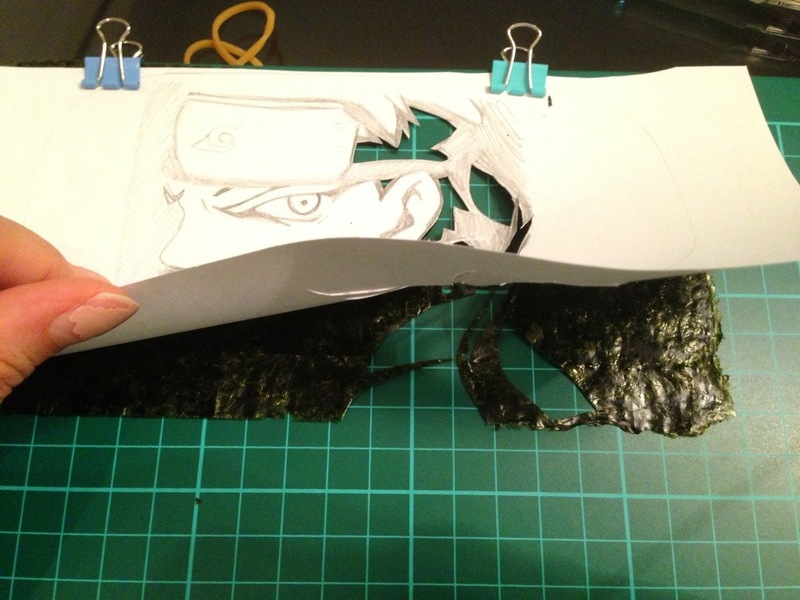 And continue the cutting while removing the seaweed bits at the same time. 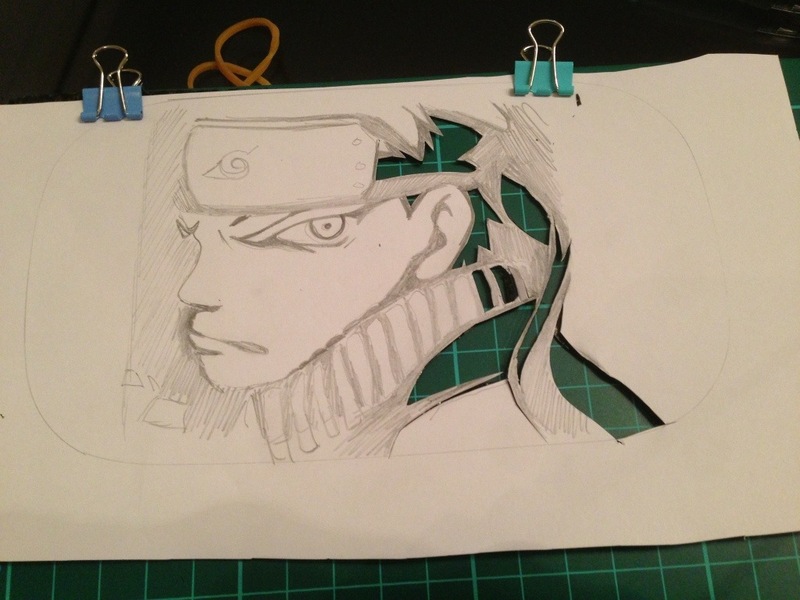 It will be easier to keep the board free of excess paper/seaweed moving around. You can see here that the patterns are starting to develop on the sheet of seaweed. 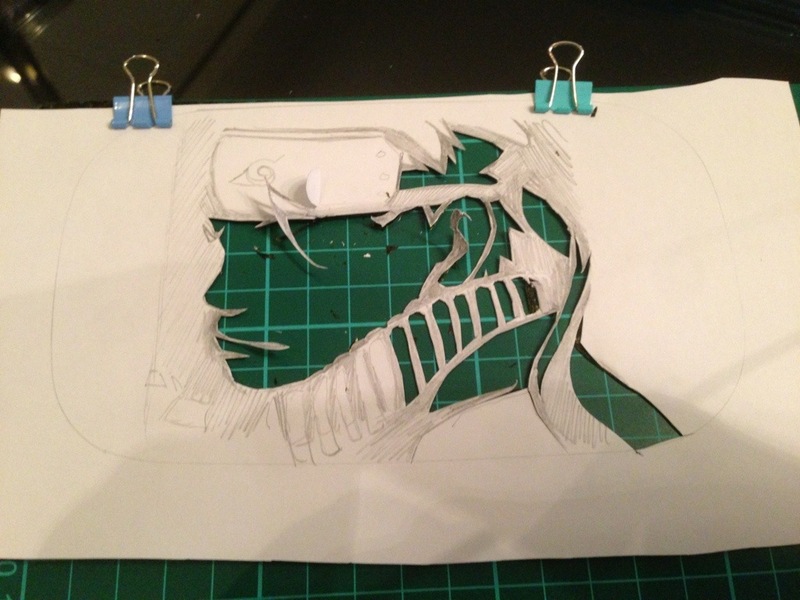 I suggest cutting the smaller bits first before you cut the large areas. 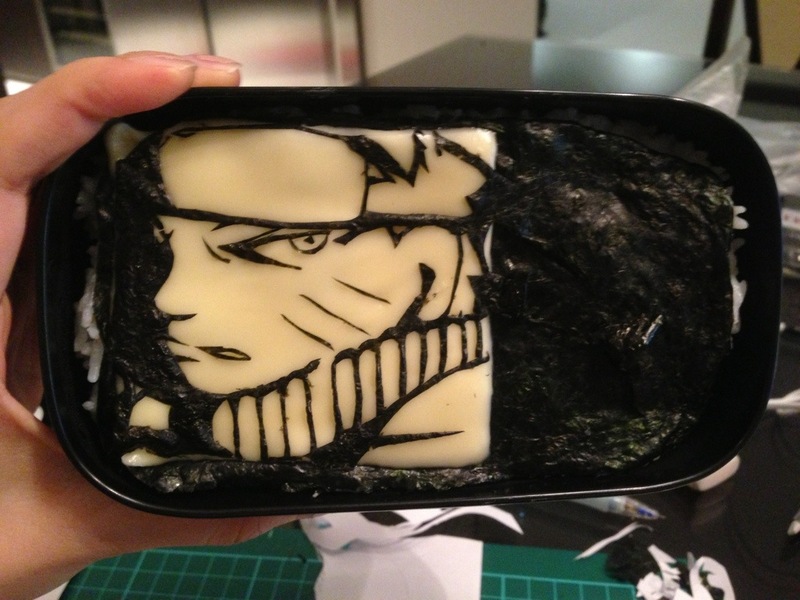 This is because its easier this way and will result in less tearing of the seaweed. 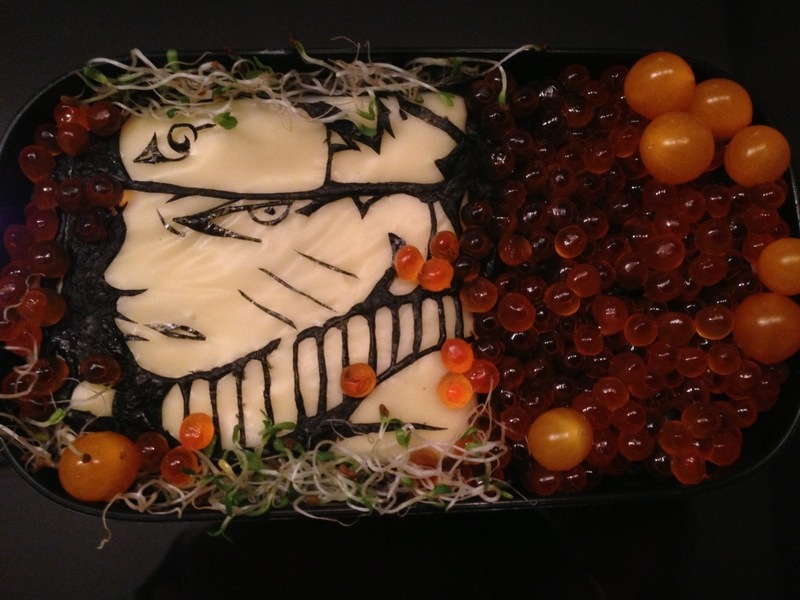 I put some rice into the bento, topped with seaweed and placed the slice of cheese where I wanted it. I’m not sure if it was a lucky mistake that I placed the cheese on the rice while it was still hot! So basically my cheese was warm and sticky such that anything that stuck to it cannot be removed! Therefore if you mess up the placement of the character here, its all ruined! On the bright side, the seaweed is more adhesive and very unlikely to fly away. 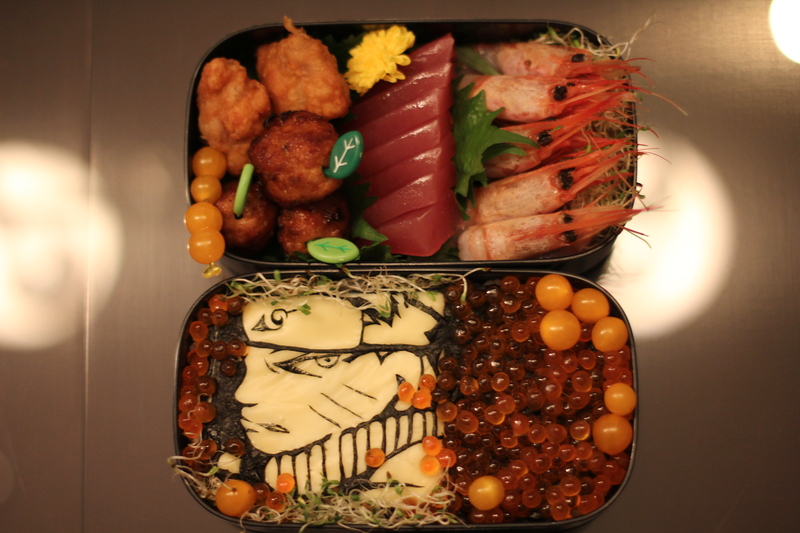 Once you’ve stuck the seaweed character onto the cheese, build your bento! 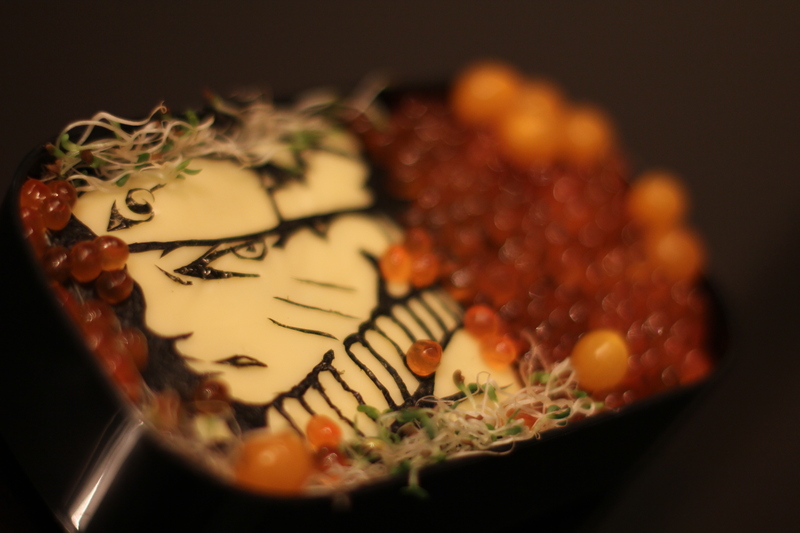 Ikura against a dark seaweed background lends a little mystery to the overall effect 😉 and the tiny yellow tomatoes were just there to contrast with the smaller ikura. 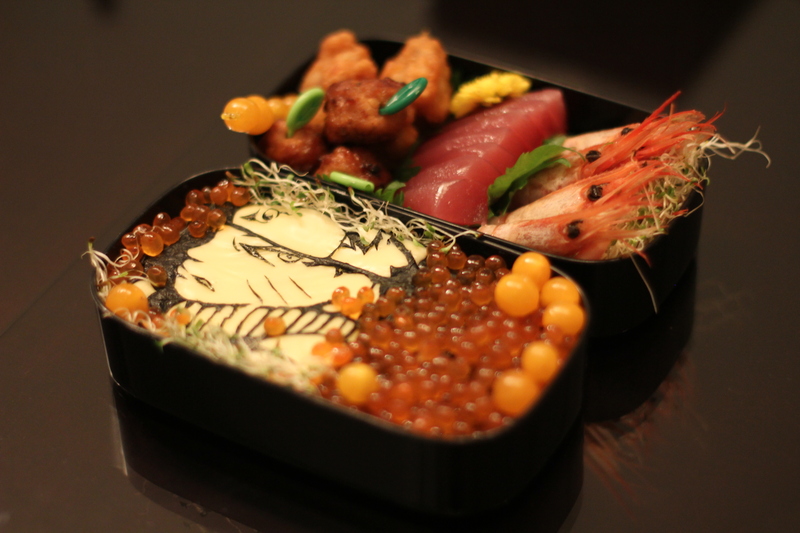 This bento is made for immediate consumption because there is no way you can put sashimi in a lunchbox and expect it to keep well in room temperature. Bacteria and all. 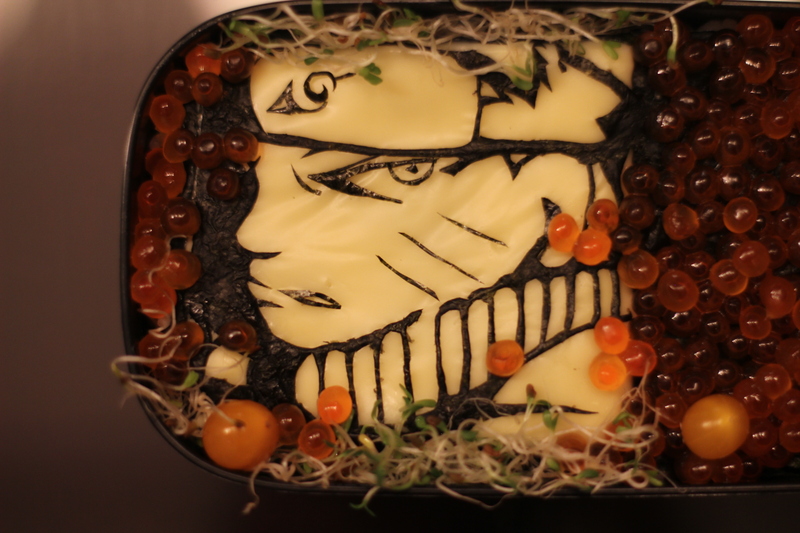 So yes, devour once you’re done with your pictures!